Aluminum is dubbed the most recycled metal today, and it can also be called the most recyclable material today, since there is no limit as to how many times aluminum can be recycled and re-recycled and re-re-recycled. But to fully understand this versatile and widely used material, we should look into the history of aluminum. Even though nowadays we couldn’t imagine our lives without aluminum, because it is used in virtually any industry form food packaging to construction to vehicle manufacturing, this material wasn’t around 200 hundred years ago. Aluminum was discovered at the beginning of 19h century, in 1808 to be exact, by Sir Humphry Davy, who discovered that aluminum can be produced by reducing electrolytic count in aluminum oxide a.k.a. alumina. However Davy wasn’t able to prove this in practice and it wasn’t until 1825 when Hans Christian Oersted was able to actually produce aluminum alloy and 1827 when Friedrich Woehler produced aluminum powder. But solidified aluminum first came into existence only in 1845 when the same man Friedrich Woehler produced solidified molted aluminum. And 9 years later finally industrial aluminum was born, when Frenchman Henri-Erienne Sainte-Claire Deville together with his partners improved the aluminum creation method and tweaked so it was perfect for industrial application. Of course at first aluminum was quite expensive, which is why in 19th century aluminum was very much an elite material and used only to produce luxury materials, like for example medals and jewelry. But when Paul Heroult and Charles Hall (both men worked separately and independently) discovered a little more cost-effective way of producing aluminum in 1886, by reducing molten aluminum oxide in cryolite, aluminum became more widely available. 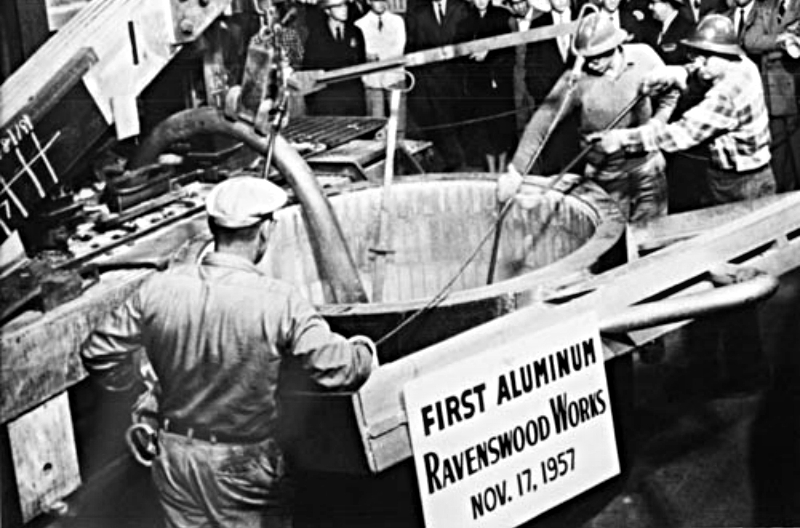 The downside to this aluminum production method was that it consumed so much electric power, which again prompted others to try and develop new ways to make aluminum, because the aluminum smelter needed to be located close to a natural power station like hydroelectric power station, in order for it to be profitable. No wonder that several aluminum smelters were established close to hydroelectric stations at the end of 19th century. Finally in 1889 Austrian chemist Karl Joseph Bayer developed a cheap method of how to produce aluminum oxide, which became the raw material from which aluminum was created. Nowadays new aluminum is produced combining the Hall-Heroult and Bayer methods, by using bauxite as raw material. But it still takes up a lot of resources, which is why it is so important to replace aluminum production a new with aluminum recycling.